Good coffee percolators are hard to come by. More often than not, the problem stems from the fact that some pieces will eventually break down. Well, this cannot be easily remedied as coffee percolators are usually subjected to direct heat. But wouldn’t it be wonderful if there is a percolator out there that can withstand the test of time? On another note, a huge problem when it comes to finding a good coffee percolator is the fact that coffee percolators tend to over-extract the coffee beans. Just like previously, there is no quick solution for this because it is the result of the actual design of a percolator. Then again, wouldn’t it be great if your coffee percolator does not over-extract coffee beans? The Chinook Timberline Coffee Percolator might just be the answer to those two questions. It is the case because the product boasts durability but high-quality brews as well. With that said, we are going to review the Chinook Timberline Coffee Percolator and find out if these two claims are true. Let’s take a look at some features and list down the pros and cons of using it. Do you want to know if this is the coffee percolator for you? Then, keep on reading! Chinook Technical Outdoor, from the name itself, is a company that specializes in products that are used for family camping and mountaineering. With that tidbit alone, you are given a clue that their products are really top notch in terms of surviving the wilderness and other extreme conditions. Will that tidbit speak leagues about their coffee percolator? For that, we will find out later on. Going back to what the company is all about, part of their mission is to provide products that are self-propelled and are suited for the outdoor-oriented lifestyle. With that information, we can conclude two things about their products: they are made of high-quality material, and they are durable. Now, aren’t those the answers to our questions earlier? Does the Chinook Timberline Coffee Percolator have these features? Let’s find out! Actually, Chinook offers a lot of percolators to choose from. They have percolators in different sizes and capacities, but in terms of design, all variants look the same. For the benefit of this review, we will concentrate on the six-cup coffee percolator. 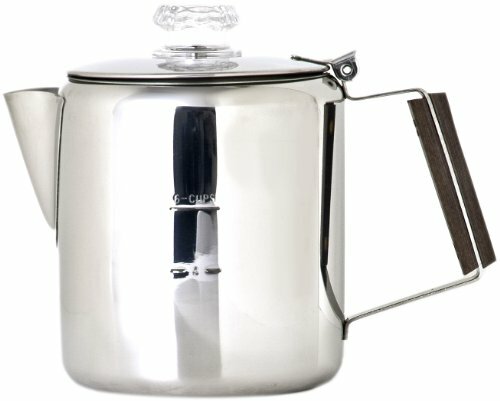 The Chinook Timberline Coffee Percolator is made of 18/8 stainless steel that was polished to perfection. This polishing technique gives it that mirror-like finish. As for the knob, it has a plastic one. The handle, on the other hand, is heat-insulating but is protected by two pieces of permawood on either side. The overall shape of the body is squoval, which is different from most percolators that are cylindrical. Also, it has a transparent water indicator at the sides. However, the indication is only six cups. So, when brewing below that line, you need to estimate, and above that line, it is presumed to be up to eight cups. Technically, this six-cup coffee percolator can brew eight cups. Just like any other percolators, it does not need filters because it has a standard percolator basket with a bunch of holes. Therefore, you have to use coarse coffee grounds, so as not to let the beans go through the basket and mix with the brew. With your convenience in mind, this percolator was designed to be dishwasher-safe. The product dimensions are 7.1 by 4.8 by 6.7 inches, and the total weight is 1.15 pounds. 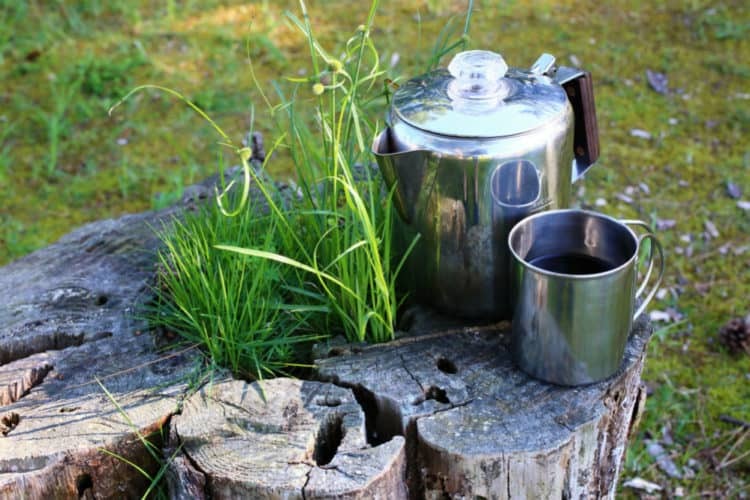 The Chinook Timberline Coffee Percolator is just like any regular coffee percolator, except for one thing—it was built to be very convenient to use. Unlike other percolators, wherein the brewer should really be knowledgeable on how to get the best out of a single brew, with this product, all you have to do is to focus on the water and grind ratio. More than that, just like most of the products of Chinook Technical Outdoor, this percolator is extremely durable. You might drop it or even use it as a weapon against harmful elements while you are camping in the wild, and you will see that it will not break. Yes, there might be dents, but surely, you can still use it after a good beating. The Cook n Home Coffee Percolator differs from the Chinook percolator in such a way that the former puts emphasis on form for it to have a great tasting brew. With this feature alone, it drastically beats the one from Chinook. This is the case because once the lid is closed, the design was made to function like a vacuum. It brews faster as no heat can escape, but at the same time, once perking is done, the temperature is properly maintained. As you might know, this is a huge flaw with the Chinook because it has a poor lid design. Is that feature enough to beat the Chinook? Let us find out. If you ask us, the Chinook Timberline Coffee Percolator is still the way to go. Again, just like what we discussed earlier, we are after the quality of the brew and the durability of the percolator. For both of those points, the Chinook gave huge check marks. Yes, it might not have a flawless design, but that little flaw does not hinder this monster to deliver you high-quality coffee everytime you use it. More than that, even if the knob breaks down through time, the body and the base are still good to go.